Heavy fog shrouded the American airdrome at Souilly, France, on 9 October 1918. 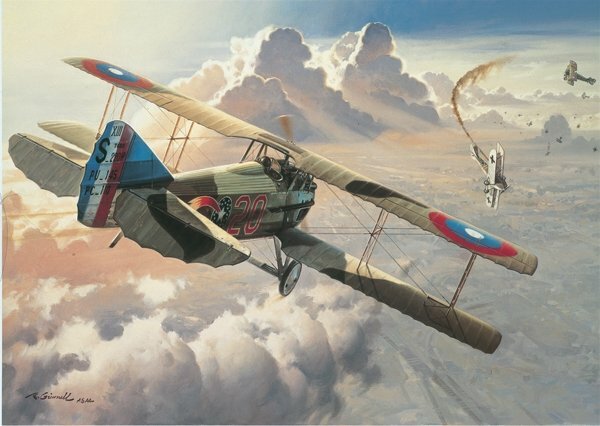 At noon it began to clear, allowing Lt. A Raymond Brooks, to take off, leading a flight of seven other SPAD XIIIs of the 22nd Aero Squadron. Brooks wasflying number 20, with the inscription “Smith IV” beneath the cockpit, in honor of his fiancée who attended Smith Collegein North Hampton, Massachusetts. They climbed out to 3,500 meters, setting their course for the Verdun area.At 1350 hours they spotted four German two-place D.F.W. observation planes escorted by nearly a dozen Fokker D-IIs. Brooks led his flight to the attack. In the ensuing battle oneof the D.F.W. fell to Brooks’ guns. Flight member Lt. Clinton Jones downed another, which brought his total to five and made him an ace. Hand signed by Ace Ray Brooks and artist Roy Grinnell.